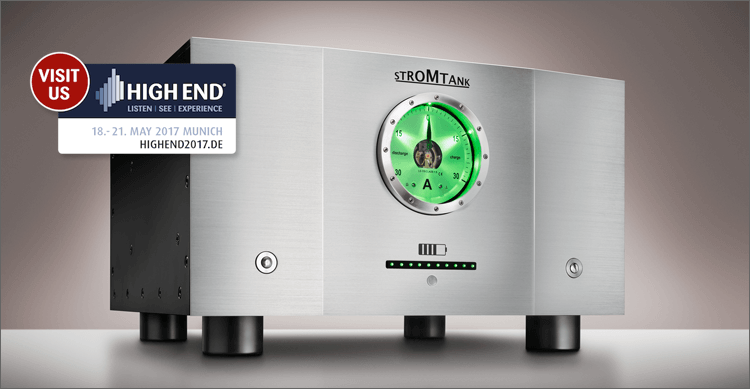 The new Stromtank model for audio requirements will be shown at the coming High-End show in Munich, May 18th – 21st 2017. One new Stromtank model from the manufacturer WinBat Technology will be presented at the High-end audio show in Munich: additional to Stromtank S 5000 will be introduced the compact S 2500 model. Stromtank is a high power battery pack with integrated pure-sign wave converter. The Stromtank totally disconnects audio systems from the grid to avoid DC voltage, high level, frequencies and other interferences that reduce audio quality. The Stromtank offers the possibility to get a pure and stable grid signal at any time of the day. Depending on the model Stromtank has a storage capacity up to 5.000Wh and is contained in lithium-iron-phosphate-cells. These LiFe-PO4 cells are intrinsically safe, environmentally friendly, very cycle-resistant and lightweight. The excellent load capacity and a long service life speak for the future of this technology. The development of the intelligent and unique battery management system is carried out in cooperation with the Frauenhofer-Institution (IIS) Nuremberg. It is possible to listen to music up to 8 hours before recharging processes start. Its innovative high-tech features also improve the quality of premium home theatre equipment, visually and sonically, enormously. Creator of this audio-declaration of independence is Wolfgang Meletzky – designer of high-end reference components and founder of MBL.